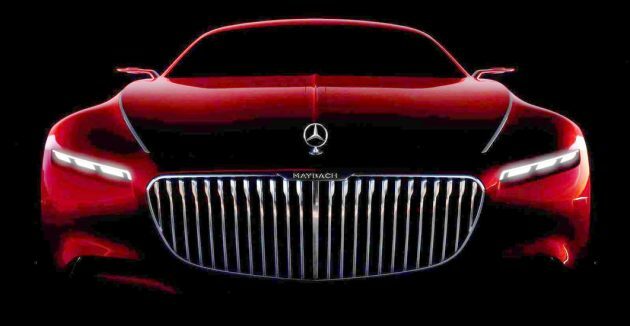 The Vision Mercedes-Maybach 6 concept has been teased once more, this time bringing into view its front with the large, imposing grille suggesting the use of a very large powertrain under the bonnet. The number ‘6’ is a reference to its considerable length in metres, while the term “Vision” refers to the company’s perspective of things to come within its realm. Notably, the front of the concept features the imposing, vertically slatted grille which harks back to Maybachs of the past, including the more recent W240 Maybach 57/62 from 2002. The side mirrors on the Maybach also appear to be relatively miniscule, which means the luxury coupe concept will employ cameras instead of conventional mirrors. This coupe concept follows the Maybach Exelero from 2004, which was a one-off; it remains to be seen if the Vision Mercedes-Maybach 6 will translate into a regular production model. If it does, the most likely powertrain of choice will be one of Mercedes’ own V12 twin-turbo powerplants, as befitting a flagship model. Having said that, Auto Express reports that the concept car is likely to materialise as a production model as soon as next year, positioned above the S-Class Coupe. The Vision Mercedes-Maybach 6 is scheduled to make its debut at the Pebble Beach Concours d’Elegance on Thursday, August 18. Whatde devil? Devilfish mounth kah? Wow so similar to RX-VISION. The silhouette tease, the red color scheme all points back to the Mazda concept car. FYI, the maybach exelero was sold at 8 million usd..